What is it about young children and snot? Even when they're healthy they seem to have large quantities of gloopy slimy yuck pouring out of their noses. Have you noticed how you always have a snot mark on your shoulder? Snot and dribble. The parent's badge of honour! It's like carrying around your own portable gack machine. So why do kids always seem to have snotty noses? The short answer is that the vast majority of children who have snotty noses just have a mild viral infection. Or 10. Why do Children get so much Snot? Not blowing your nose properly. There are several contributing factors to my children’s runny noses. The first being that they aren’t that great at blowing their noses. Some children learn quicker than others. But if they don’t blow it away the snot hangs around going backwards and forwards like a slimy yo-yo. The best thing is to teach your children to blow their noses, throw away the hankie and wash their hands. Here are 9 natural ways to ward of colds and protect your kid’s from infection. Often a runny nose is a sign of infection. The nose makes clear mucus that helps to wash away the germs and protects the lungs from invading bugs. When the immune system starts making cells such as white blood cells to fight the infection, the snot will turn white or yellow. Children have immature immune systems so they need to learn to fight off bugs. Adult’s immune systems are much better at fighting bugs to they don’t get so many colds. It can seem like children always have runny noses as one infection runs into another without having a chance to recover properly in between. Here’s why kids get so many colds and what you need to know if your baby has a cold. Snot is green either because it has bacteria in it, or because certain enzymes which help fight off bugs contain a green pigment. Do Antibiotics work when children have Colds? There are different types of bugs that can cause infections. The most common are bacteria and viruses. Colds are caused by viruses. Antibiotics only work on bacteria, they don't do anything to viruses. If they have an infection caused by a bacteria, they will need antibiotics. What if my Asthmatic Child has a Cold? Children who have asthma may be more affected by coughs and colds because it can trigger the asthma. If you are worried about your child's breathing when they have a cold, you should go and see your doctor. Your doctor can teach you how to increase your medications when their asthma is triggered. This is a great site that tells you all about asthma. 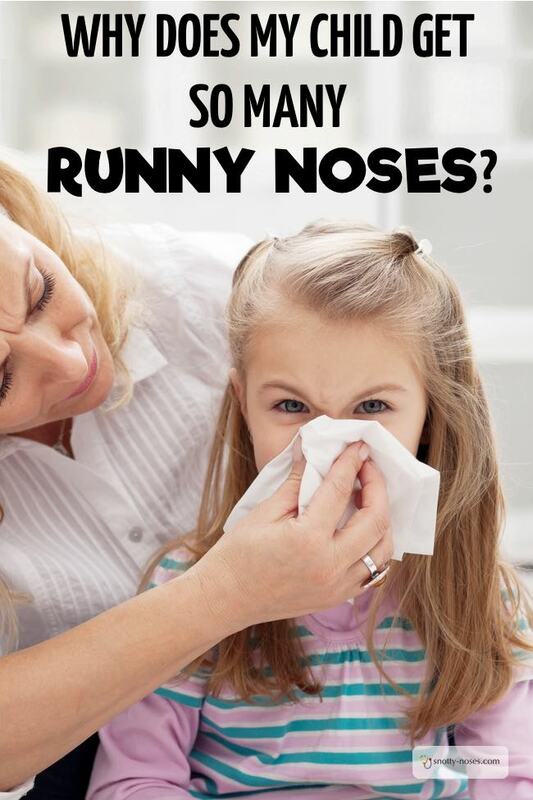 By far the most common cause of a runny nose in children is a common cold but there are other causes too. Dr Wei, a paediatric ENT doctor, also says that drinking milk before bed, snacking after dinner or too much dairy through out the day can cause a chronic runny nose. I wipe a way the dribble and slime that is on my shoulder. It mingles in with the orange splodge from lunch time. Despite the never ending slime that comes out of my kids I know that their snotty noses are just a sign of a mild infection. And that one day they’ll learn how to blow them properly. I’m just not sure when that will be!